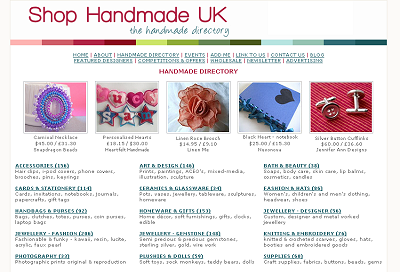 The Shop Handmade UK directory has steadily been growing and has now reached over 1500 UK based designer-makers so I think it's time for an overhaul of the directory. My aim is to help shoppers find you and your products based on the end use or function. I'm proposing removing just 2 categories, changing the names of others and adding to most a range of sub categories as some of the main categories like Jewellery, Accessories and Homeware & Gift are getting very large. I'd also like in each sub-category to feature in the top 5 product spots a product from every designer-maker listed in that sub-category so there is variety on each page. Ceramics & Glassware - Removed as the category it based on medium used not function. The majority listed fall under Homeware & Gift so most would move to these categories. Some jewellery designer-makers are listed here, they will move to Jewellery. Hats will be moved to Accessories. Gifts General - For all products that don't really fit into other categories from Edible goods to unusual good that would generally be gift related only. Knitting & Embroidery - Removed as the category it based on medium used not fuction. Goods in this category will move to Accessories, Fashion, Homewares or Gifts. These are just proposed changes, I'd really like your input and suggestions especially on the new sub-categories so please leave a comment and let me know what you'd like to see. Looks good. I don't really know enough about the other crafts to comment on those but Jewellery seems to have a good split. One question, Since I make my beads I do also sell beads on there own, is it possible to have the same shop in two categories or would it just go off the main product sold? I know that for two shops and two product types we would have two separate listings but when it's part and parcel would it be classified differently. Thanks for your comment. Yes you can go in both categories, jewellery and suppies. 2 separate listings but if you have both products in the 1 store then both listings would link to the same store.